Obaid Suroor received a bachelor’s degree in fine arts from Cairo University in 1979. Upon graduation he returned to his native emirate to establish an art workshop for talented young artists at the Al Qassimiyah School, where he himself had learned to draw as a child and still acts as a mentor. Suroor is a founding member of the Emirates Fine Arts Society and is the supervisor of Association’s Studio in Ras Al Khaimah. His works, which draw heavily on the UAE’s natural landscape, have been exhibited throughout the country, as well as in Belgium, Egypt, France, Jordan, and Syria. A prolific artist, he houses his large body of work, comprised of mostly mixed-media paintings, in his Ras Al Khaimah studio. Obaid Suroor’s surroundings have heavily influenced his subject matter. The artist’s works often feature familiar aspects of Ras Al Khaimah, an emirate known for its black rock mountains, expansive sea, towering forts, and traditional mudbrick houses. He does not restrict himself to conventional mediums when documenting Emirati heritage. Suroor sometimes uses fabric from traditional jalabiya dresses as canvas, and found objects, such as discarded oyster shells and antique wood window shutters, for embellishment. 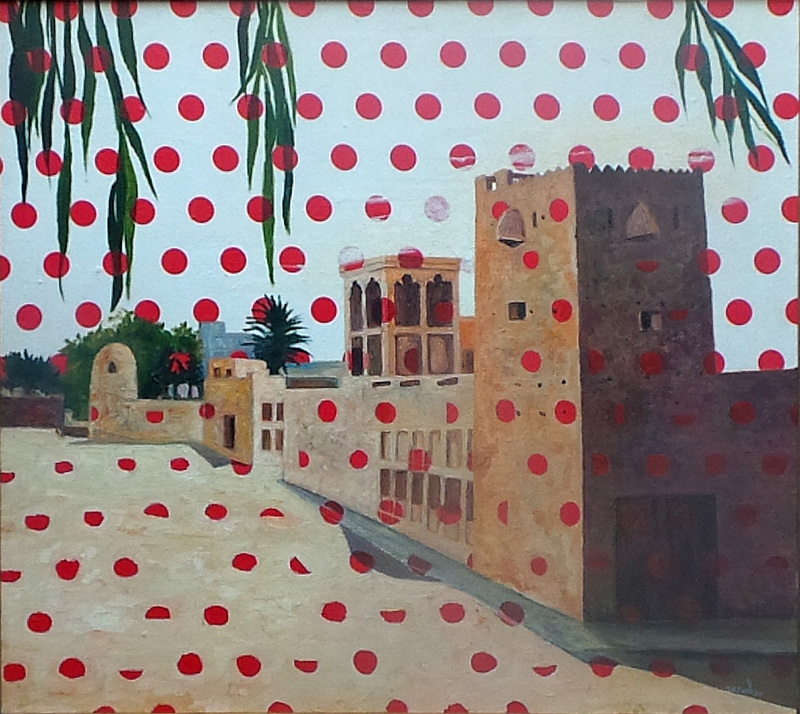 In Old Houses, he overlays the scene with a dot pattern, which references traditional Emirati fabric designs. For the artist, the painting signifies the importance of the country’s land and culture.